Scott Glaser paints a trompe l'oeil of piano tuner Fred Patella for the "Sing for Hope Pop-Up Pianos" art installation in New York City. A fine artist from Westport was recently chosen as one of 88 artists to participate in the "Sing for Hope Pop-Up Pianos" art installation on display in New York City from Saturday, June 18, to Saturday, July 2. The exhibit features 88 pianos on streets, in parks and on boardwalks throughout New York City painted by "Sing for Hope" volunteer artists. 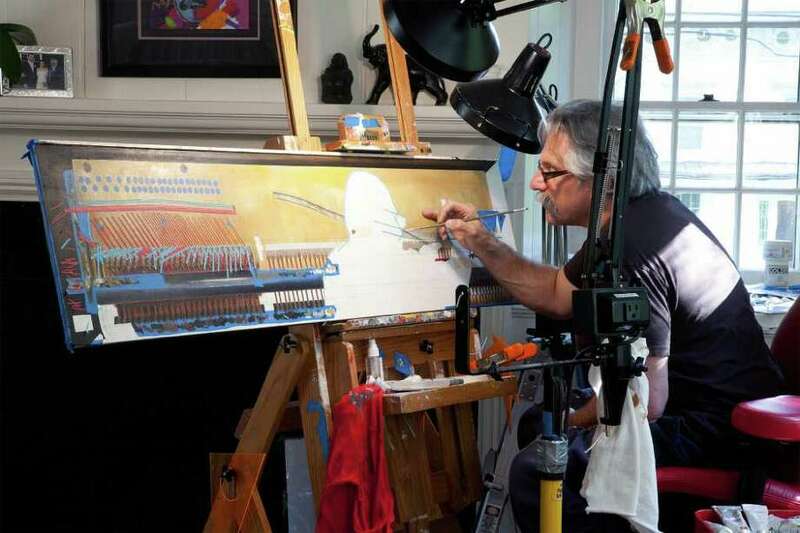 Westport artist Scott Glaser composed a trompe l'oeil painting of piano tuner Fred Patella tuning one of the pianos. Glaser's piece, which took 348 hours to paint, will be on display in Brooklyn's Fort Greene Park on Myrtle Avenue. Glaser, 58, a native of Newark, N.J., has 30 years of experience as a commercial artist in graphic design and advertising for clients such as Hyatt Hotels, China Merchants Bank and Perkins Eastman Architecture and Design. He studied art at the School of Visual Arts in New York in the early 1970s. Visit www.blazingglasers.com for informstion on Glaser; www.pianos.singforhope.org for information on the exhibit.